A patient who ingested a pipe cleaner. Central Vet Imaging Radiologists interpret a variety of x-ray studies daily. These studies include both small and large animal imaging. Radiology is the most common imaging modality in Veterinary Medicine and is a common source of referrals. Our experienced board certified Radiologists have an incredible eye for the smallest details that can be found in these studies, which can improve case management and outcome. They possess the medical knowledge to prioritize radiographic findings and convert them into a diagnosis that can guide successful treatment. Our Radiologists assist primary and specialty veterinarians in getting as much information as possible from their radiographic studies, facilitating quicker more accurate diagnosis and guiding treatment as directly as possible. Radiographic interpretation by a board certified Radiologist is not only for ill patients; geriatric screening, wellness and pre-anesthetic exams, pre-breeding exams and pregnancy evaluation are also performed on a routine basis. Radiographs are normally sent directly from the referring veterinarian by a web-based method called TELEMEDICINE. If your veterinarian does not have telemedicine capability or radiography has not be performed yet, please CONTACT US to help create a plan for your pet. Ultrasound evaluation of a dog's kidney. We work closely with your primary veterinarian to perform outpatient ultrasound services. Dr. Jones can perform ultrasound of almost any body area to help diagnose or rule out a variety of disorders that can affect pets. He routinely performs examinations of the abdomen, heart, neck, thorax, or even mass lesions on a limb. Typical organs we look at during our abdominal ultrasound studies includes: liver, spleen, kidneys, adrenal glands, bladder, stomach, intestines and pancreas. Ultrasound of the chest is commonly performed to look for causes of abnormal fluid accumulation, evaluate mass lesions such as lung tumors or abscesses, and assess heart disease. Abnormalities found with an ultrasound exam can be sampled for definitive diagnosis by performing an ultrasound guided biopsy or fine needle aspirate (FNA) at the time of the scan for microscopic evaluation. Doppler Echocardiogram with Color flow. 3-dimensional CT reconstruction of a police dog's head. Computerized tomography — also known as CT Scan — is an innovative way of imaging both small animal and large animal patients. This technology involves a series of x-ray exposures from 360 degrees around the patient and uses complex computer processing to create cross-sectional images of the bones and soft tissues inside the patient's body. CVI radiologists routinely interpet CT scans to help local (and distant) veterinarians diagnose a variety of diseases. This imaging modality can be used to scan the chest for cancer, evaluate bones for tiny fractures or destructive changes not seen on conventional x-rays, outline tumor margins for surgical planning, and much more. Areas of the body that cannot be visualized adequately with ultrasound are better seen with a CT scan. 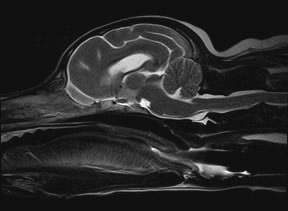 MRI evaluation of a dog's brain. As part of our services to primary care and specialist veterinarians, our team of highly trained radiologists routinely interprets MRI studies performed on animals. MRI is a highly sophisticated and technical imaging modality used to diagnose a range of diseases, most commonly involving the nervous system, such as brain tumors or spinal disc disease. In additional to brain and spine imaging, MRI is also useful to evaluate musculoskeletal disease involving any body area. It is also quite useful for imaging areas that cannot be assessed with ultrasound, such as the pelvic canal or deep tissues of the neck. We are able to evaluate, interpret and send detailed reports on MRI studies within a few hours of them being sent to our servers. MRI is excellent for surgical planning, even in emergency situations. WHAT IS A VET RADIOLOGIST?